This week my daughter is having some of her gal pals over for a little Christmas party, so I’ve been gearing up some fun Christmas craft ideas that we can make together. Every time I whip out my Instax Camera a.k.a. ‘the magic camera’ the kids are blown away, so I thought it would be fun to incorporate an Instax photo into a kids holiday photo craft for them. Plus, since I know you’re dying to get your hands on some Instax gear be sure to enter to WIN a prize pack at the bottom of this post, 3 prizes to be won! Last summer I created a similar craft for a demo I did (see it here). However it was created for adults and a bit too many steps for the 6 year olds that will be making these. Since string art can be as easy or difficult as you desire, I thought it would be the perfect addition to a photo art piece that the kids could make themselves. 1 x 6″ spruce (you can have this cut at the Home Depot to desired lengths. Small 1 photo boards are 8″ long, and the larger piece 15″ long). 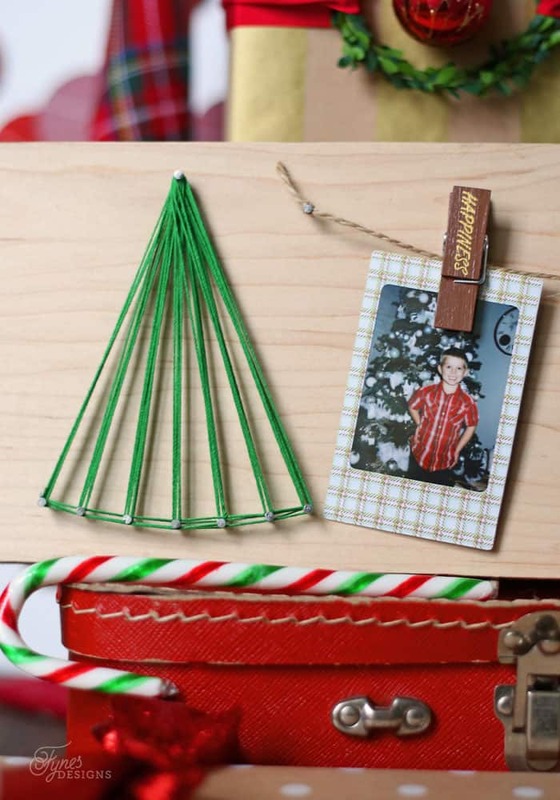 There a hundreds of string art tutorials (like this one) so I won’t include a step by step since a tree is the most simple design. Check out this blog for lots of different design ideas. Lightly pencil in your tree triangle on the board. Hammer nails into desired points leaving them raised from the surface. Tie the crochet string to a nail to start, and allow the children to travel the string from nail to nail creating a pattern. Tie off the string on a nail to end. 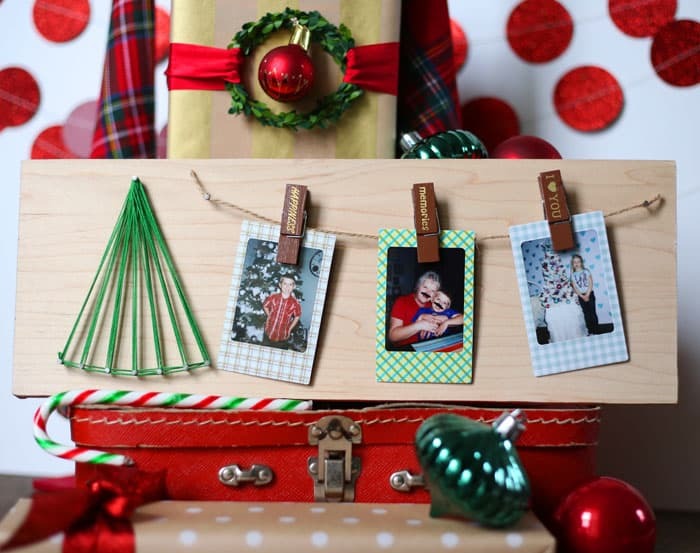 For a single picture hot glue a photo clip to display an Instax, or hammer in two additional nails to string a clothesline for multiple photos to hang. 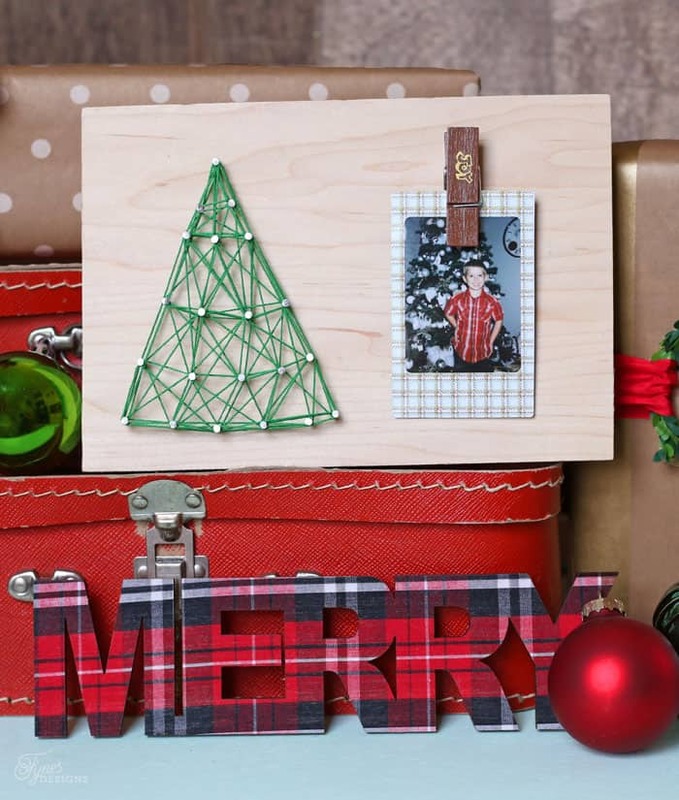 Won’t the kiddos love creating a personalized Christmas craft? 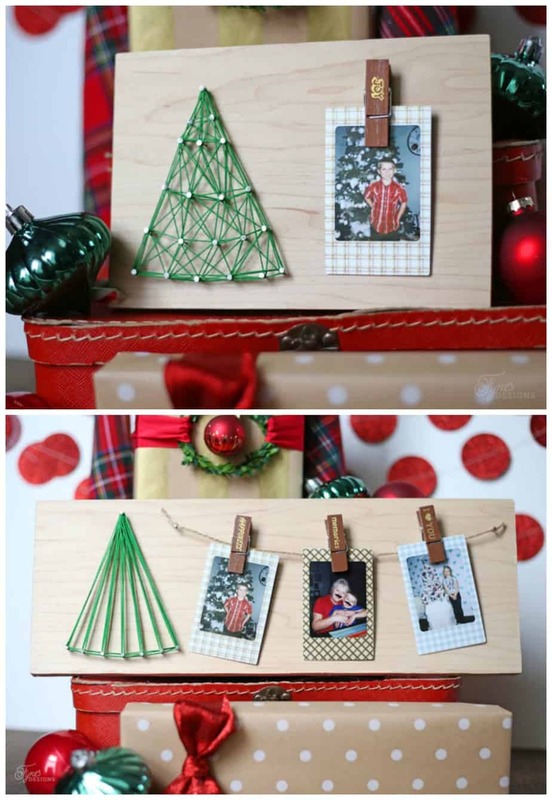 I bet Grandma would love to receive a little photo gift like this! Disclaimer- I have created this project in partnership with FUJIFILM. All ideas, and opinions are 100% my own. This post may contain affiliate links. Lets get creating with Instax together! 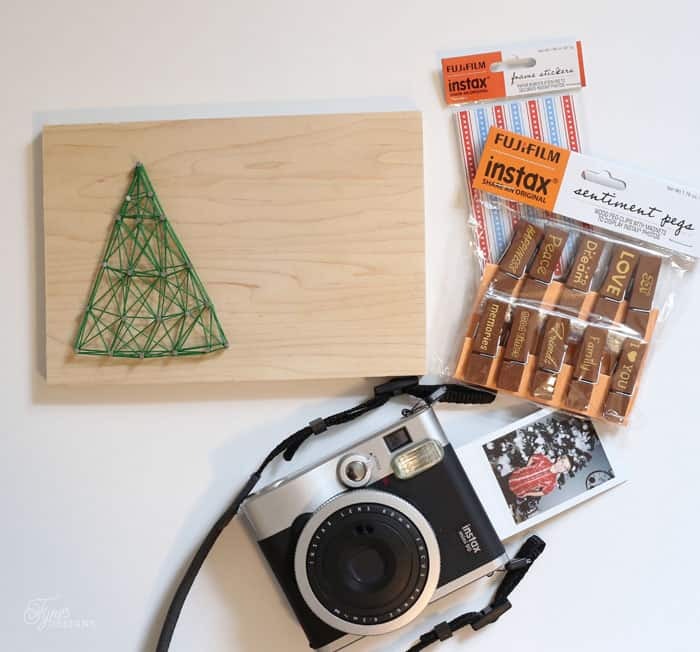 Enter to WIN one of 3 Instax prize packs!! One of my best christmas memories is the last christmas with my grandmother. We all had dinner as a huge family as she laughed and told funny jokes. That dinner will always be remembered. My favourite Christmas thus far has been this one, and it hasn’t even happened yet! Watching our daughters face light up when she sees christmas trees, decorations/lights, her elf Peekabo move each morning or opening her advent calendar has been one of the enjoyable moments to date! Best memory for me would be the year my brother and I opened all the gifts 2 weeks before Christmas the. His the opened gifts under the bed thinking my parents would know. ?? Hot chocolate and cinnamon rolls with my kids Christmas morning. My favorite Christmas memory is the very first Christmas with our oldest daughter. It was our first Christmas as parents, in our new home and had my mother and brother spend it with us. My favourite Christmas memory is the year I wanted a dump truck really bad. It had a friction motor that would make it run when you wound it up by pushing the truck as fast as you could then pick it up off its wheels and doing that again and again. When I woke up to open to my presents in the morning, it was not there. Instead my mom told me to look out the window and to my surprise and delight it was sitting there in the sandbox on a small sand hill with a big red bow on it. I still have that very truck! My favorite memory is having a Christmas pot luck at my Grandmas house with a white elephant gift exchange. I love seeing the extended family at the holidays. My mom tricked me into thinking that my aunt was getting my Nintendo. I freaked out when she opened it but then they told me it was for me! Favourite Christmas memory is my daughter’s first Christmas. It was magical. Any family get together. They are more different now with everyone getting older and my cousins having their own family, but we all see the importance in being together! My favorite Christmas memory was when my niece was just born, it was so nice having an infant there at Christmas time, so magical. I can picture that clearly today and it still makes me giggle. my fav. Christmas memory is the whole family coming together and everyone talking at once. When we were kids, my parents always let my brother and I choose our own fresh tree for our room at home while we cut down the family tree. The catch? They had to be the same height as we were that year. It was a fun tradition and one I want to carry on with my little dude. Waking up WAY too early to open stockings before Mom and Dad were up. Loved waking up early and sneaking downstairs to look at our stockings! Love this idea! I’ve been looking for something unique and inexpensive to do for a group of 11 year old girls. This is it. Thank you you for sharing. I love your site. 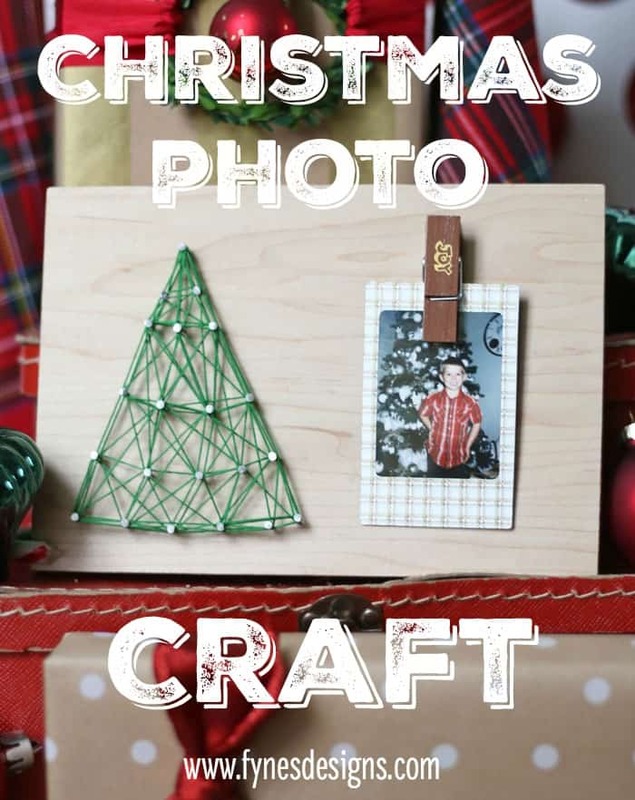 This was a great party craft, and really inexpensive! Favorite memory. Riding home from my grandparents on Christmas eve and getting so incredibly excited listening to the Santa reports on the radio. My favourite memory was the year I got my Barbie house & all the furniture for it. I remember sneaking down around 4am and playing with my “Santa” gift quietly until everyone else got up. I gave my kids a christmas puppy last year and the reaction will never leave my memory. My favorite memory is the parties at my grandmas house and seeing all the extended family. My favorite Christmas memory was when my sister, only crawling at the time, pulled the entire Christmas tree down upon herself. She wasn’t hurt, but we never had a real tree from then on. A favorite Christmas memory for me is when I woke up Christmas morning really early and then I woke my sister up. We went down stairs and were so excited that we never woke our parents up. We opened a few gifts and were playing for a while until my mom came downstairs and made us STOP LOL . Well we had to sit there and wait until everyone in the house was ready to open………it was hard starring there at our new toys! My favorite memory is baking tea cakes & putting the ornaments on the tree with my dear mama. Even more precious is the fact that I am 50 and she is 76 so we have had many wonderful years together. So thankful! She is even gonna be a great grandmother to my son’s daughter Ava who will be here in January, yay! 🙂 Merry Christmas! My favourite Christmas was when my oldest sister bought me a huge stuffed panda bear that was as big as I was. I spent weeks trying to figure out what could possibly be in a box so big. I carried the thing around with me everywhere I went for years! I don’t have a favourite Christmas memory. I love Christmas, and have many good memories since my oldest son was born in 1994. When we were little kids, my brother, sister and I got a ride-on bouncy horse as a gift, so much fun! My favorite Christmas memory was when we were little and we went to our cottage and we went sledding on our new sleds on Christmas day! I really hope we have snow this Christmas? My favourite Christmas memory is opening gifts with my gigantic family at my Grandmothers. The wrapping paper would be over our heads there was so much!! My favorite holiday memory is spending time with family! My mom was waiting for me to come home for Christmas. Little did i know it would be her last as she was ill with cancer. I remember coming in the house, her huge smile, she had been so anxious for me to get home for Christmas. We both cherished the moment. Something I will never forget. Hug and kiss your loved ones as you never know what is in the future. My favourite memory was going back in the woods with my Granny to cut down a Christmas tree. My favorite Christmas memory is driving around our town looking at all the Christmas light displays on Christmas Eve when i was a kid. My favourite memory was getting my barbie dream house! i never really celebrated much as a kid only a few times with my dad but i have to say now with my own kids i love this time of year because the whole family has time off together and it’s great for bonding. My favorite memory is sitting around Dad’s table with my family having dinner. When I was little it was the year that Cabbage Patch Kid dolls hit the height of popularity, people were fighting over them & there weren’t any left in stores. I had asked for one but didn’t think I would get one. Santa (somehow) managed to give me one & it was purely magical! I treasure the feeling of that Christmas. I had a very similar memory! Moms got game! mine was when my first son wa 9 months old. My favorite memory is the first years my children were able to open their gifts on their own and everyone since. I love their looks and reactions. I think my fave was the year my husband and I got engaged- just a few days before Christmas 16 years ago! So many happy memories have come because of that special Christmas! woot woot, so happy for you and your family! Have a blessed season! Favorite Christmas memory with my parents was going to Mexico to meet my paternal side of the family for the 1st time. They celebrated Christmas with a gift exchange (for us) and it was all about family. I have two favorite Christmas memories. 1) When I was a child, we would decorate the tree and then turn off all the lights and leave the tree lights on. We would listen to Christmas music and eat cookies. It was magical. 2) Right after college, I went to Asia for a year as a missionary. I was on a team of 8 people, all of us just out of college and we grew super close. It was hard for me to be away from my family because I am really close to them, but my team seriously made it one of the best Christmases ever. Everyone bought each other well-thought out gifts, which was even harder to find in another country! We ate together, sang together, and celebrated Christ together. I still dearly love all of those people. A favourite Christmas memory for me is getting new Christmas pjs on Christmas eve as an early gift. My favourite Christmas memory is the one where I got the Cabbage Patch Kid I’d been wanting – my Mom lined up in the snow for hours to get it! ha ha, we love that too!